Now fans can channel their inner-Yoda. Star Wars fans have been saying it for years, "May 'The Force' be with you." Now "The Force" really can be with you, well, sorta. The people over at Lucas Licensing have given their blessing to a new toy -- the Force Trainer. The Force Trainer won't really make kids (and kids at heart) into Jedi masters but it does present an interesting future for interactive games. The toy allows users to move a ball up and down a clear tube using their mind -- something like a lung capacity test for your brain. 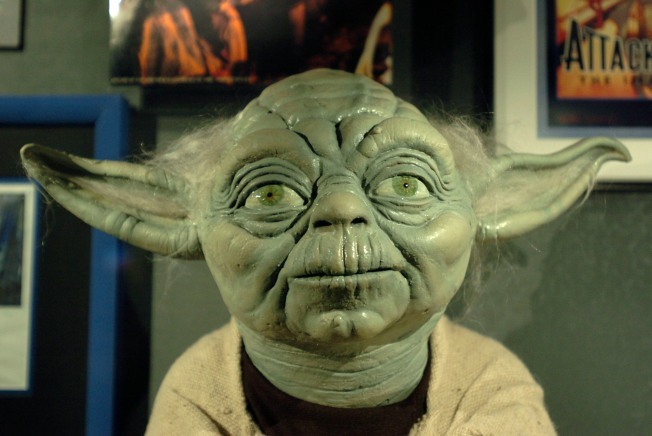 Star Wars sayings from familiar voices come from the base of the toy to encourage a user in their "training." The strange tube-shaped toy -- unveiled at the Consumer Electronics Show in Las Vegas -- includes a headset that takes your brain waves to make the toy go. It's being called one of the first brain-to-computer mass-marketed toys on the market. The toy uses a simplified version of medical electroencephalogram, or EEG, in which thoughts translate to physical motion. The headset reads and interprets brainwaves using dry EEG technology that measure and record brain activity by using sensors (electrodes) attached to the head, according to a Lucas Films release. So how much deep thought is needed to use "The Force?" "When you concentrate, it activates the training remote," Frank Adler of toymaker Uncle Milton Industries, which is creating the Trainer, told USA Today. "There is a flow of air that will move the (ball). You can actually feel like you are in a zone," he said. Star Wars nuts looking to channel their inner-Yoda are expected to have to shell out about $90 - $100 for a Force Trainer. And oh yeah -- may "The Force" be with you.